Coaching is a guided process that supports you create the results you want. It offers a framework for you to set stretching and challenging goals; plan strategies and actions to achieve your goals; be held accountable for taking action; and develop thoughts feelings and behaviours that will enable your success. Teams needing better experience with diversity, inclusion, and team cultures that support performance. Group Coaching works well for individuals when discovery, experimentation and drawing on the collective wisdom of others will add value to their coaching experience. Among other things, it is great for developing interpersonal skills, personal power and presence. Stephen Harrison is an Associate Certified Coach (ACC) through and member of the International Coach Federation (ICF), is committed to upholding the ICF Code of Conduct and his ongoing professional development; and was trained through the NeuroLeadership Group, an ICF-accredited training organisation. Broaden your field of understanding and application by introducing concepts and ideas that may be outside your typical focus and background. While the figure is a generalisation, it does indicate broadly the distinctions between approaches used to support individuals and groups. Consulting and Mentoring rely on experts providing advice to clients. The expert effectively assumes a degree of responsibility for the outcomes produced. They TELL the client what they need to know and ought to do. Counselling and Coaching rely on asking questions to draw out of the client what the client already knows, assisting the client tune into their own wisdom. The value they bring is in how they ASK questions, stimulate thinking, and open the client to themselves, what is going on for and within them. Consulting and Counselling focus on solving problems. While the client may couch requests in terms of seeking a solution, the approach tends to identify and address problems. They are backward looking in terms of understanding what led to the current situation and finding a way forward. 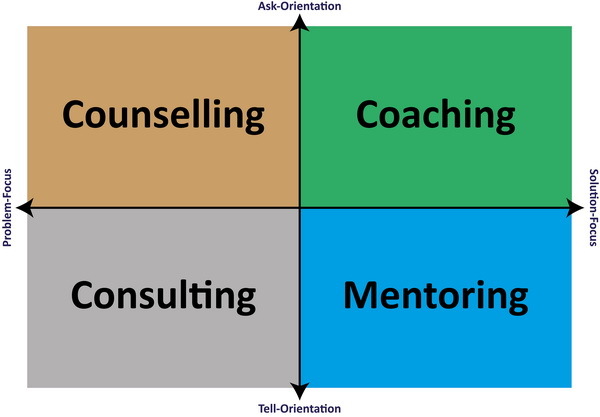 Coaching and Mentoring are solution-focused, looking at where the client desires to be, and they focus on what is required to transition from the current state to the new one. These are forward moving approaches. Coaching leaves responsibility with the client, and through quality questions facilitates the client in clarifying what they want to create, what their future state will be, and how to make the necessary transition. Coaching recognises that each client is a unique being, with a brain that has the capacity to develop its own solutions, and that the client will own the results when they are their own insights. When answers are provided from others’ thinking the ownership and commitment of the client to the idea is lower. Developing their own insight, the client experiences changes in their own neural pathways, and in a very physiological manner the ideas are very literally theirs. Each person has their unique strengths, weaknesses, experiences, personality and brain. Stephen believes that every person has a unique contribution to make, and that we are most motivated when working congruent with our values, beliefs and purpose. Imagine if more people lived to their full potential. What, how and where each of us are best to contribute is, however, not always that clear and making sense of this is a life long journey of discovery and learning. As a coach, his intent is to be a wise guide to people who are committed to taking ownership of their lives and seeking to improve their capabilities. He encourages coachees to discover their life purpose and personal values, set stretch goals that matter to them, gain clarity on the strategies and actions required to achieve their goals, and develop effective responses challenges to deliver the desired results. Stephen’s coaching methodology draws on a wide range of disciplines including adult learning, neuropsychology, positive psychology, whole brain thinking, career development, organisational development, systems thinking, complexity leadership theory and action methods. He undertakes regular professional supervision to assure the best possible results for his clients. Stephen adheres to and am bound by the International Coach Federation Code of Conduct. This includes assurance that each session is held in strict confidence between the Coach and Coachee. The International Coach Federation (ICF), founded in 1995, is a globally-recognised organisation with its purpose being “to lead global advancement of the coaching profession”. Their envisioned future is that “coaching is an integral part of society and ICF members represent the highest quality in professional coaching”. As such, I am bound by the ICF Code of Conduct, and am working through the various levels of accreditation to advance my capabilities and deliver the best possible coaching to my clients. Stephen has been trained against these competencies and endeavours to apply them consistently in his coaching practice. Additional information on these competencies can be obtained from the ICF web site. Stephen will work with you (in Individual Coaching), with you as part of a group (in Group Coaching), and with your team (in Team Coaching) to ensure you have the ingredients needed to develop insight; learn; identify and implement needed change; and to assure optimum performance. With teams, this also includes attending to their culture, group dynamics, and work processes and practices as necessary. By working with you to achieve inter- and intra-personal congruence and access to your full capacity and capability, your energy and attention is applied to create your desired outcomes. Contact Stephen about your specific requirements. E-mail him or Book a Coaching Session with him now or read more about What Stephen offers.